Your liver is located on the right side of your body in the upper right abdomen below your ribcage. The liver is one of the largest internal organs in your body and its main function is to filter blood and remove toxins. Your liver also plays an important role in your digestive system. Liver pain can be felt in the upper right abdomen or on the middle of the back and it can be caused by disease or infection that makes the liver swell. This article looks at the important functions that the liver has in the body. You will also learn about the main causes of liver pain and the side your liver is on. Knowing what causes pain in the liver can help you make positive lifestyle choices to protect the health of your liver. At the end of the article, you will find out great natural remedies to strengthen your liver. Your liver is located in the upper right-hand side of your abdomen and is protected by your ribs. The liver sits just above your stomach and below your lungs. 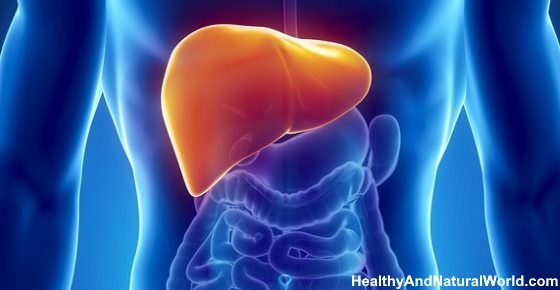 Your liver helps the body break down and digest food by producing bile. Doctors from Stanford Children’s Health say that bile from the liver breaks down fats from your food so that it can be digested properly and your body absorbs all the necessary nutrients. Taking into consideration the important work your liver does, it’s important to keep your liver healthy. Before we look at ways to boost the health of your liver and keep it functioning properly, let’s look at the main reasons for liver pain. For example, hepatitis causes inflammation in the liver which will make you feel pain under your right-hand ribs. Or, inflammation in the bile ducts coming from the liver can cause pain just above your stomach. If these symptoms persist and you have pain in your upper abdomen, then you should visit your doctor who will perform a blood test to check how your liver is functioning. An accumulation of fat in the liver can lead to fatty liver disease. Doctors from the Mayo Clinic say that one of the symptoms of fatty liver disease is pain in the upper right abdomen. Dr. William Blahd on WebMD says there are two main types of fatty liver disease – nonalcoholic fatty liver disease (NAFLD) and alcoholic fatty liver disease (AFLD). Doctors aren’t sure what causes NAFLD, however being overweight, having high cholesterol, contracting a viral infection, or suffering from an autoimmune disease have been connected with NAFLD. Alcoholic fatty liver disease is caused by drinking too much alcohol. Dr. Blahd says that even a short period of binge drinking can cause fatty liver disease.5 You may even feel pain in your liver after an episode of heavy drinking. For more information on what to do about fatty liver disease, please read my article on how to prevent fatty liver disease naturally. Hepatitis C infections and drinking too much alcohol are the main causes of liver cirrhosis. Doctors from the NHS say that other symptoms of cirrhosis of the liver include weight loss, nausea, tiredness, itchy yellow skin, swelling in the legs and ankles, and a tendency to bleed more easily. Along with the pain in and around your liver area, hepatitis can cause a mild fever, fatigue, and muscle or joint aches. If the infection causing pain in your liver becomes worse, you may also notice that your skin turns yellow, your urine is dark, or you pass light-colored fatty stools. Another condition that can cause liver pain is infectious mononucleosis (mono). This is a very contagious viral infection that can cause inflammation of the liver and pain. Dr. Melissa Conrad Stöppler on MedicineNet says that mononucleosis can be detected by a blood test to check the number of white blood cells. The usual symptoms or mono is fever, a sore throat, and swollen lymph nodes.8 It’s only when the infection gets worse that it will cause liver pain. Liver cysts can sometimes cause the liver to enlarge and become painful. Liver cysts are small sacs of fluid that develop in the liver. Usually, liver cysts don’t cause any painful symptoms and they can be left alone. Certain medical conditions can cause too much iron to build up in the liver and cause hemochromatosis. Although iron is important for good health, too much iron is bad for your liver. If hemochromatosis isn’t treated early enough, the iron levels in the liver can build up so much that it damages the liver. This can lead to liver pain because the liver swells and becomes damaged and scarred. Cancer of the liver can be one of the reasons for liver pain on the right side of your ribs. Tumors in the liver can cause it to become enlarged and painful. Of course, liver pain isn’t the only sign of liver cancer. Liver cancer can also cause an enlarged spleen which can cause pain under your left ribs. There are many natural ingredients that can help to strengthen your liver health. Many ingredients help to remove toxins from the blood or contain antioxidants that help to rid free radicals from the liver. It’s also important to make healthy lifestyle choices to prevent conditions that lead to liver pain and disease. You should drink plenty of water to help flush out toxins from your liver and prevent liver pain. Not drinking enough water can lead to dehydration which has a negative impact on your general health. You should incorporate more garlic in your diet to help keep your liver healthy and pain-free. Garlic and can help to destroy toxins that damage the liver due to its powerful medicinal properties. To find out how to use garlic as a medicine, please read my article about how garlic can be used as an antibiotic. Because the overconsumption of alcohol causes liver damage, you should limit your alcohol intake to avoid liver pain and prevent liver disease. Alcohol puts extra strain on the liver as it tries to flush the toxins from your blood. Therefore limiting alcohol consumption is one of the 5 common habits that damage your liver. Green leafy vegetables are an excellent source of antioxidants that can keep your liver healthy. They are some of the best foods to cleanse your liver and prevent liver disease. Beets are another vegetable with liver-protecting properties. Beets contain a number of beneficial antioxidants and they are one of the best foods to help keep your blood healthy. Beets are a great way to reduce inflammation in the body and prevent its negative effects on your health. You can check out my recipe for super anti inflammatory beet and ginger juice. To help keep your liver healthy and reduce your risk of liver disease, you should drink more green tea. Green tea has many amazing health benefits and can help to boost your digestion and cleanse toxins from your system. If you have liver pain, you can try to drink more lemon water to help strengthen your liver health. Apart from containing high amounts of vitamin C, lemons have a detoxifying effect on your liver and can help reduce inflammation. One of the reasons to incorporate more turmeric into your diet is to boost your liver function. Turmeric is an herb with many health benefits that reduces inflammation and swelling. For helpful advice on how to use more turmeric in your diet to improve your liver health, please read my article on how cooking affects turmeric. Your diet has a large impact on the health of your liver. We’ve already seen that a diet that incorporates more vegetables and plant-based foods boosts your liver function. Also, cutting down on alcohol helps to keep your liver working properly. However, a healthy diet in itself is a great way to strengthen your liver and care for your overall health. Also, you should cut out sugar from your diet as much as possible to help prevent liver disease and other health complications. It may surprise you, but cleaning your teeth regularly can actually help reduce the risk of suffering complications from cirrhosis of the liver. Good oral hygiene practices like regular brushing and flossing help to remove bacteria from your mouth and prevent it reaching your liver. You can take care of your teeth and gums by brushing regularly with a natural toothpaste to remove plaque. You should also avoid some common mistakes when brushing your teeth if you want to have good oral hygiene. WebMD. Picture of the liver. StanfordChildrens. Anatomy and function of the liver. MedicineNet. Definition of liver pain. ClevelandClinic. Liver cysts and tumors. NHLBI. Signs and symptoms of hemochromatosis. Cancer. Signs and symptoms of liver cancer. Evid Based Complement Alternat Med. 2015; 2015: 824185. Avicenna J Phytomed. 2014 Jan-Feb; 4(1): 1–14. WebMD. Understanding cirrhosis of the liver. Lipids Health Dis. 2013 Nov 5;12:168. J Clin Biochem Nutr. 2008 Nov; 43(3): 201–209. NCBI. Turmeric, the golden spice. Curr Opin Lipidol. 2014 Feb; 25(1): 61–66. Hepat Med. 2016; 8: 97–103.